The Society is working with the following academic programs to advance the field of health communications. To get your program involved, learn more about becoming an organizational member. Program: M.A program in Emerging Media (with a specialization in Health Communication and Health Communication Certificate program. Explore a range of tools and techniques for developing effective health-oriented messages. Faculty have extensive backgrounds in diverse areas ranging from direct to consumer prescription drug advertising to the impact of social media on mental health. Students in the program, too, represent diverse interests and the program with its applied orientation provides an extensive set of opportunities to foster those interests. Recent Emerging Media graduates have obtained positions with the U.S. Food and Drug Administration and CHADD: Children and Adults with ADHD. Description: We are a collection of over 50 faculty members who engage in communication-based education, outreach, and research related to risk reduction and health promotion. We engage trans-disciplinary communication research and activities that promote healthy lifestyle choices, address environmental risk factors, and maintain food security. The HRCC Center team includes experts in the areas of health and risk communication, environmental and science communication, mass media, new technology, interpersonal communication, family communication, and intercultural communication. Our team uses message production, statistical methods, focus groups, and surveys to study topics related to a wide variety of topical areas ranging from obesity to water conservation. Our team is able to provide specialized knowledge and expertise on all aspects of the communication process and we offer specialized services that can be applied to any health or risk issue. Address critical health issues through this graduate program, co-sponsored with the College of Human Medicine. Learn to design, write, implement and evaluate evidence-based health communication materials to help prevent and address health problems in our society. Graduates have a strong placement rate including positions at the World Health Organization, UNICEF, and Centers for Disease Control and Prevention. Description: Tufts University's Health Communication Program offers students a full-range of educational opportunities to fit their career goals and provides the skills and knowledge necessary for graduates to assume a range of roles in diverse settings: federal agencies, hospitals, health departments, biotech companies, publishing firms, foundations, and other nonprofits. A leader in the field, Tufts introduced one of the first master’s degrees in health communication in 1994. We provide a range of options designed to meet the needs of students and working professionals alike; these include a full master's degree program, an online certificate program in digital health communication, and professional development courses. Program faculty are communication specialists and public health and medical professionals with diverse experiences and interests. Health communication is advancing rapidly with new technologies and media, social marketing, health literacy and culturally competent materials. All of these developments make for an exciting and challenging field. The Master of Science in Health Communication program emphasizes a public health approach to communication and addresses the full continuum of health communication interactions, ranging from one-on-one to mass communication. The program also places a heavy emphasis on "hands-on" applied learning, with each student expected to complete an advanced level applied learning project in order to graduate. As a result, graduates receive the skills and knowledge to assume a range of roles in diverse settings. The Certificate in Digital Health Communication program builds upon this existing expertise by offering the few graduate-level programs of its kind. Designed for working professionals, the certificate can be completed on a part-time basis in one year. The program consists of five courses including a one-week long in person summer course and four online courses. Professional Development in Health Communication courses enable students to keep pace - and even be a leader in their organization - through our professional development training opportunities. Students can take a 1-week in-person class or an online class. Learn how to apply commercial marketing principles to individual and social change. Participants will gain a global perspective as they develop a social marketing strategy and work plan targeting a pressing public health problem. This online course examines the potential and impact of mobile devices for health. Students will conceptualize and design health apps and devices that incorporate evidence-based guidelines and capitalize on the mobility, portability, and input/output capabilities of smartphones and other mobile devices. This one-week course will introduce participants to key principles in health and medical journalism with the aim of both fostering a better understanding of the processes that underlie the decisions made by news entities and helping participants develop strategies to utilize the broad reach of the news media to communicate important health and public health messages. Gain the skills and knowledge needed to improve the health literacy of health professionals and consumers. Learn to identify health literacy competencies specific to your audience and develop a curriculum or educational program to achieve identified measurable objectives. Learn how to develop and implement a digital strategy to drive a health organization’s online presence, specifically the processes for selecting, using, managing, and evaluating the effectiveness of web, social media, and mobile technologies. Description: The Department of Community and Family Health offers several program concentrations related to health communication, health promotion, and social marketing. We provide a challenging, educational experience in a nurturing and community oriented environment that will prepare students to enter the workforce, ready to fulfill their life goals and dreams. Students interested in health communication may have the opportunity to do research or projects with the Florida Prevention Research Center, funded by CDC, or the WHO Collaborating Center for Social Marketing, all staffed by faculty and students within the Department. 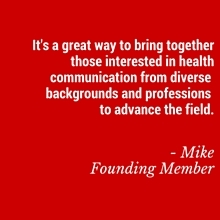 Description: The Center for Health Communication was established in 2014 to bring together researchers and experts on many diverse areas of health communication into one organizational unit where they can collaborate, share ideas and innovations, and advance their scholarship and its impact to the highest possible level. The CHC has more than 40 affiliated faculty and graduate students from across the university. As of April 2017, the CHC is officially a joint academic center of both the Moody College of Communication and Dell Medical School. Our people have broad and deep communication expertise that allows our Center to lead the creation of evidence-based health communication scholarship, education, and community involvement. Our interdisciplinary group of scholars embraces opportunities to use communication to improve the health of people around the globe.